By Daniel Greene - Lifestyles Editor · March 31st, 2019 at 3:49 p.m. Despite concerns over low housing availability, Kelowna residents have made it clear to City Council that they want short term rentals. As early as April, 2019, the City of Kelowna may allow short term rentals in designated residential zones. As it stands, rentals shorter than thirty days are prohibited in residential zones across Kelowna. However, despite the current regulations, Kelowna residents continue to use sites such as Airbnb and VRBO to host guests illegally. But if a recent zoning bylaw amendment is approved, and it looks like it will be, residents will soon be able to rent out their properties, provided they follow specific rules. The original amendment suggests that short term rentals be restricted to the host’s principal residency. This means that separate basement suites, or detached dwellings such as carriage houses, would be excluded from the new short term rental amendment bylaw. However, on March 12, a passionate response from over two-hundred Kelowna residents at the City Council chambers convinced Mayor Colin Basran to reconsider this stipulation. As a result, the City Council directed staff to make further amendments that would allow for short term rentals in secondary suites. 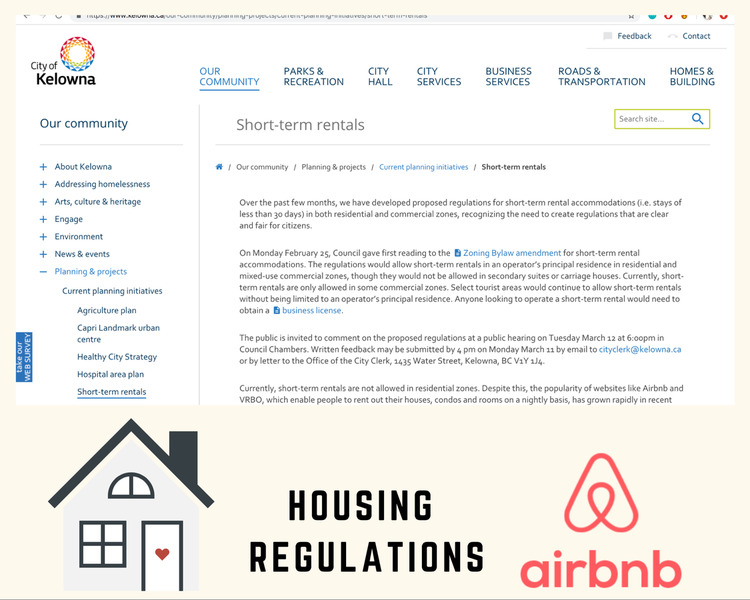 Under the new proposed bylaw, all operators of short term rentals would be required to obtain a business license. The zoning bylaw amendment states that this will cost approximately $320,000 in administrative costs and enforcement, but also recognizes that the cost will be supported by operator licensing fees. Despite the outpouring of support for the change in bylaw, the amendment is not free from opposition. Many argue that opening secondary residential units to tourists and short term renters will essentially eliminate an already tiny and shrinking long term rental market for Kelowna locals. Others are concerned about the possibly that sites such as Airbnb may bring ‘bad neighbours’ into their communities. But for many, sites like Airbnb offer a source of income that is much more flexible, and in some cases more profitable, than long term rentals. And in a city where the cost of living is ever increasing, residents are likely to take whatever they can get.